The home side had the better of the early few minutes before the Cinderford forwards got into their stride and before long were making good ground, after a number of pick and drives Cinderford were able to score under the posts. The conversion made it 7-0. Cinderford kept up the momentum and before long had extended their lead with the ball being moved out wide to score in the corner. Cinderford extended their lead with another try following more up your jumper rugby by the forwards. Abergavenny / Monmouthgot back into the game with an interception try. The fourth try came following a clever kick to the corner with the Cinderford wing getting his boots dirty and sliding though in the corner despite a pile of Welsh bodies being in the way. To round things off Cinderford scored under the posts from a quickly taken tap penalty. Considering the conditions this was a fine display by Cinderford and also credit to the opposition for making an entertaining game of it. Abergavenny / Monmouth were no push over and have certainly improved since the two sides had met earlier in the season. 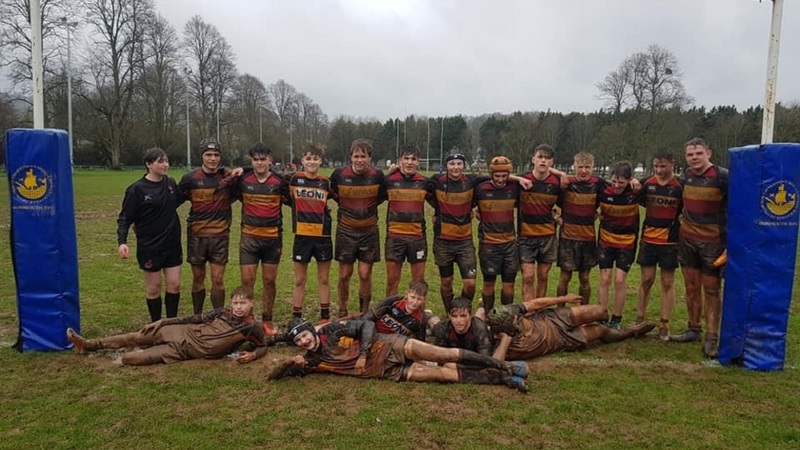 However the conditions were a great leveller, but Cinderford played to their strengths and made the best of those conditions.